Being a NICU Mom, I have no problem in accepting that I am paranoid. The thought of leaving my baby in the next room for a whole night gives me hives. And that’s why for the peace of my mind, I had no other option but to co-sleep with my baby. Here, from co-sleeping I mean, sleeping in the same bed with my baby. My son A has slept in bed with us for more than a year (he is 1.5 years old now). Before that, in the initial days after he came home from NICU, he used to sleep in the cradle next to our bed. My son needed lots of rocking and swinging to fall asleep, hence the cradle. When he was five months old, we shifted him from cradle to our bed. Having your baby next to you in your bed gives you a sense of contentment, cuddling with him, smelling the baby scent, it’s pure bliss. Also, you don’t have to worry about if he is sleeping okay, wondering has he thrown his blanket off or not, or whether he is too hot or cold etc. It’s one of the most significant advantages of co-sleeping. Since infants need to be fed every other hour or so, having your breastfeeding infant in your bed makes nursing easy. For an uninterrupted sleep when you can nurse your baby while lying down. 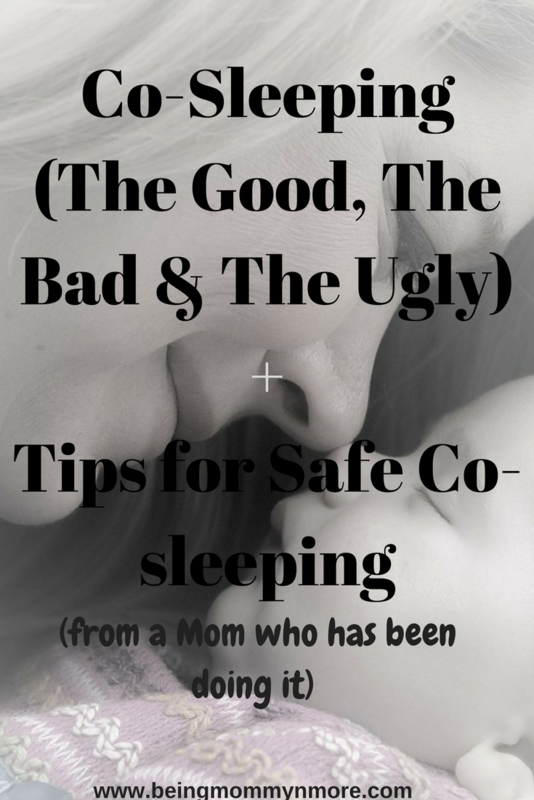 Co-sleeping plays an integral part in mother and infant bonding. Mother and baby are in coordination of their sleep cycles, which makes her more sensitive to her baby. I have personally experienced it if my baby was uncomfortable for any reason, I usually sensed it, whether he is too hot inside the blanket, or he just wanted to be held. If you are a working mom, co-sleeping allows you more interaction time with your baby; it is a great way to spend some time together and grow your relationship. Whenever your baby cries and wakes up at night (which babies do a LOT and not always because of hunger), you can just pat or cuddle to soothe him. This way, you might be able to stop the high pitch crying and screaming before it starts, making easier to soothe the baby and make him fall asleep back faster. Studies have shown co-sleeping reduces the risk of SIDS, In Asian countries like Japan and India, where co-sleeping is a cultural norm, SIDs rate is lowest. Co-sleeping provides quick and efficient baby care. If a baby is struggling to breathe, choking, or covers his head with blanket somehow, co-sleeping can alert the parent soon to these issues. In initial days of co-sleeping with your baby, you have to be little conscious while sleeping, so you don’t smother your baby in sleep. I was terrified initially of the same. But with time and a few safety precautions, it was easy. Still, be sure to have few restless nights over this, especially if you are someone who requires lots of space to sleep. I was that person, before my baby, now I can sleep in the furthest corner of the bed, without falling. Ahh, the things motherhood teaches you. Your baby gets used to sleeping with you or mostly falls asleep while nursing. They have a hard time falling asleep with someone else. Your baby falls asleep nursing, and just when you start to move to get in a different position since you have been lying on your side nursing him for hours. He wakes up!!! Sometimes I end up on one side for so long; I can’t feel anything there. If you have won the battle of moving from your position, well getting up from the bed is another big battle. The moment you get up from the bed to empty your bladder killing you for past hour or so, your baby’s mommy antenna starts working, and these no stopping the high pitch crying. Remember all those kicks from your pregnancy days? Well now that he is out, how can he forget to kick? And once your baby becomes a toddler, the kicking takes a whole new level. 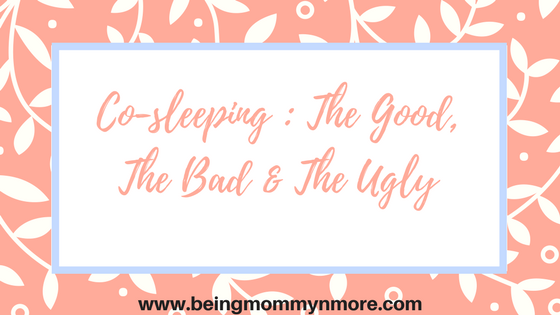 So here it is the good, the bad and the ugly of co-sleeping with your baby. When I see my baby’s angelic face sleeping peacefully next to me For me, it’s all worth it. Always put your baby to sleep on his/her back, not on his tummy. Use lightweight blankets, specially made small in sizes for babies. Use baby mattresses or safe infant sleeping bags. A large bed (queen size or king size) is best for safe co-sleeping. Do you co-sleep with your baby? What are your experiences? Tell me in the comments section.